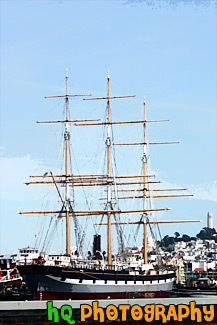 A scenic picture taken of a the Balclutha boat on a blue sky sunny day located in the San Francisco, California bay. In the background you can see Coit Tower sitting on Telegraph Hill. The overall length of The Balclutha is 301 feet, length of deck is 256.5 feet, the beam is 38.6 feet, the depth is 22.7 feet, the gross tonnage is 1689, and the height of teh mainmast is 145 feet. On January 15, 1887, with a twenty-six-man crew, Balclutha sailed under British registry from Cardiff, Wales, on her maiden voyage towards San Francisco. The ship entered the San Francisco Golden Gate after 140 days at sea, unloaded cargo of 2,650 tons of coal, and took on sacks of California wheat. Besides sailing to San Francisco, in 1899 The Balclutha for three years sailed north to the Puget Sound, Washington and then across Austrailia.